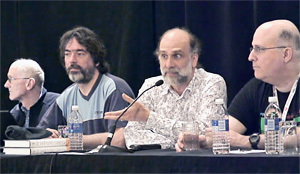 IETF 88 Technical Plenary: Hardening The InternetInternet security has been a primary focus this week for more than 1100 engineers and technologists from around the world gathered at the 88th meeting of the Internet Engineering Task Force (IETF). Participants are rethinking approaches to security across a wide range of technical areas. IETF Technical Plenary Video archive available here. Also see related blog post by IETF Chair, "Strengthening the Internet." Local Time: Friday, April 19, 2019 11:27 PM PDT – Page Load: 0.3387 Sec.